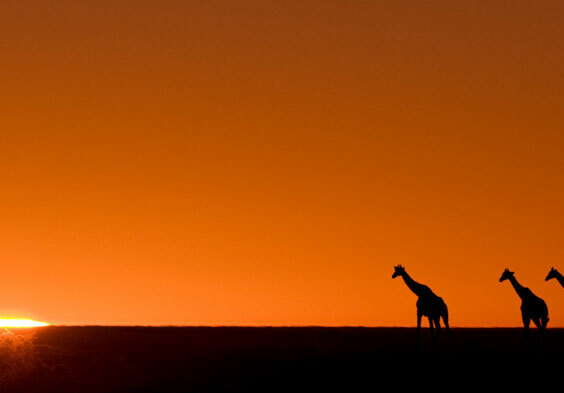 amibia is a land of breathtaking beauty, desolation, natural wonders and unexpected worldly charm. This desert country stretching along the barren Western Skeleton coast of Africa features the world’s highest sand dunes at Sossussvlei and at Cape Cross, one of the largest seal colonies. 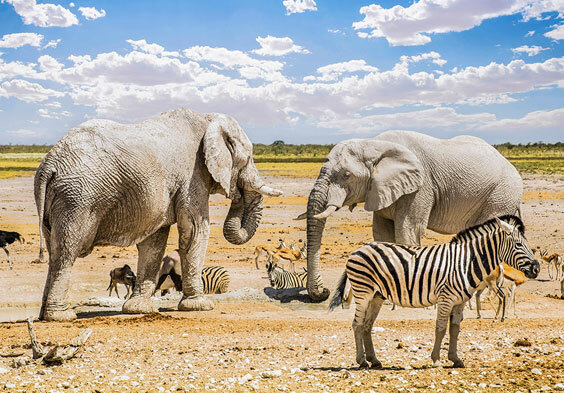 The magnificent Fish River Canyon has spectacular rock paintings, while the sprawling salt pan game park at Etosha boasts incredible sightings of herds of animals on the open plains. 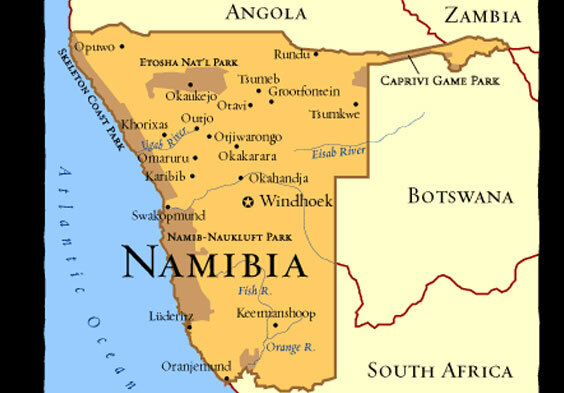 In contrast, there are lively fishing and holiday harbor towns like Swakopmund, while inland the capitol, Windhoek, still boasts the Bavarian architecture and cuisine of its colonial German roots. You will be charmed by the traditional Himbas and the Herero people still wearing colonial western dresses. 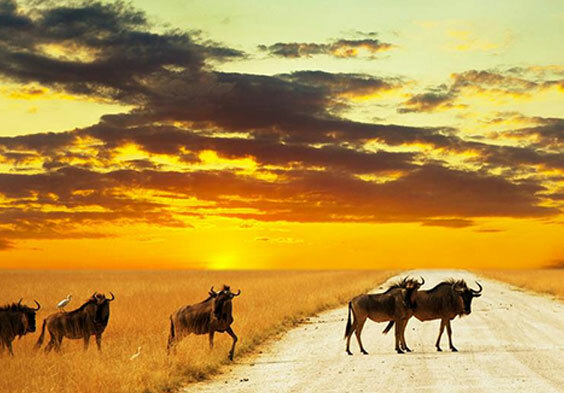 This amazing country will leave indelible memories etched in your mind. Tour the museum and the National Art Gallery. Head towards the red sand dunes of Sossusvlei that form the gateway into the Namib Desert. 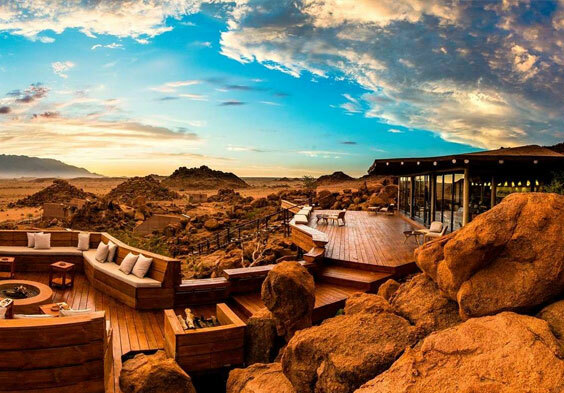 Visit the Namib’s highest dune, Dune 45. Visit the deep-sea harbor and admire the prolific birdlife of Walvis Bay, the tourist center of Namibia, on the Atlantic coast. 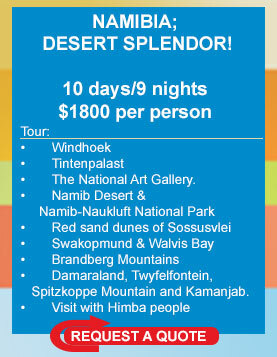 Swakopmund is also a popular Namibian holiday destination. See Herero groups in colonial western dress. Head to the Brandberg Mountains, of special significance to the San (Bushmen). Up the Skeleton Coast through desert landscapes of Damaraland, Twyfelfontein, . Spitzkoppe Mountain and Kamanjab. See rock engravings, petrified fossil forests and unusual flora, such as welwitsia and baobab and the semi-nomadic Himba people with unique style of hair and dress. Travel the world with Elsa from your comfy chair! Travels with Elsa provides custom tours for small groups to suit individual budgets and special needs. Travel the world with Elsa from your armchair.